I love this time of year – there are just so many amazing natural events that just need to be explored. Getting crafty with them is just one of the ways and this week I was asked to judge the fabulous Kids Crafts 101 hashtag on Instagram. KidsCrafts101 was started by the amazing Maggy from Red Ted Art and Ali from Incredibusy and together they have hosted and invited guest judges to explore the hashtag and feature them on the Instagram Account Kids Crafts 101. With over 17,000 images in the hashtag (#kidscrafts101), it’s a fantastic one to use when you are featuring crafts and art with your children and has a great community spirit. As a judge, I have chosen 9 from this week to feature here today my favorites that have caught my eye and make me want to get crafty with nature. 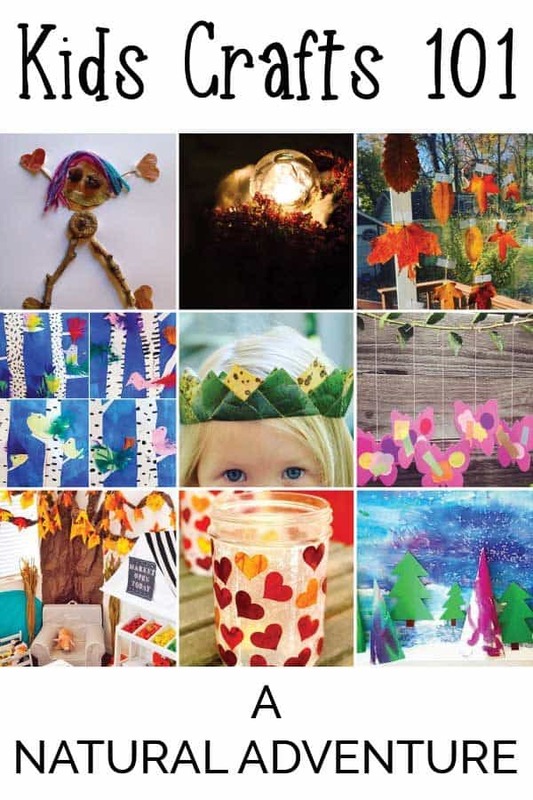 First off is this leaf gal from Thea Scott – I just love using leaves in crafts and activities and with so many around at this time of year and FREE it is a perfect resource to add to your crafting. Ice lanterns just look so beautiful and this is something that I can’t wait to try this year and I’m keeping my fingers crossed that it will be cold enough. Willowday as long being a favorite account to follow and the crafts, art and style of her images are fantastic. Leaves are great, but inside the home, they dry out and become brittle. Preserving them in wax is a great way to make them last as well as increase the transparency of them to create a sun catcher effect. The instastory of The WorkSpace for Children caught my eye this week and the beautiful hanging leaves as well. Although it maybe, heading into Summer in the Southern Hemisphere that doesn’t stop Mother Nurtured from getting crafty with nature. I love this leaf crown and with fresh new leaves as well instead of the normal brown, orange and gold leaves you see in the autumn. Nature provides such a fantastic opportunity and it’s not just with the use of the materials how about using them to display the artwork as well. Wee Warhols combined some paper crafts with a branch and some STEM investigations as well. Using leaves when they don’t look like leaves is a fun way to increase the possibilities of them as an art and craft resource. This leaf lantern is so pretty and will take you through from Autumn all the way through to Valentine’s day. Rhythms of Play is another fabulous account to follow with ideas for more intentional and outdoor based learning, crafts and play. Taking inspiration from Nature there are so many different ways to explore. Lnnally has used watercolours, resist and salt make an interesting effect and this snowy winter scheme is so pretty I love the 3D nature of the trees as it makes the whole scene pop even more. Crafts can be as small or as big as you want. Little Tiny Learners has crafted some beautiful fall leaves and then on a giant scale used them to decorate a corner in the playroom making it perfect for seasonal learning. Inspired by nature and using natural elements Paperbirds London creates a scene of winter birch trees with colourful birds and feathers hiding amongst the trunks. 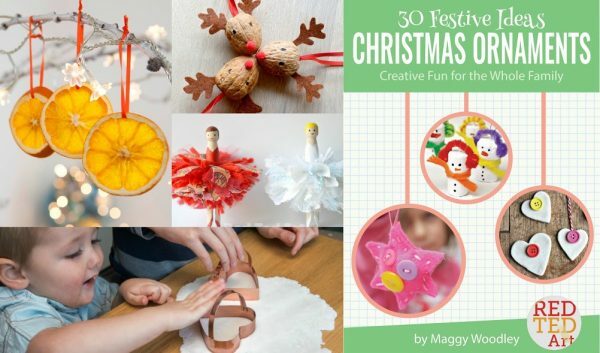 Prepare for your Christmas Crafting with this fantastic E-Book of 30 Festive Ideas ~ Christmas Ornaments by Maggy of Red Ted Art and one of the founders of Kids Crafts 101. Priced at $7.99 it is full of ideas perfect for all ages in your family. To buy you can click on this link or on the image and it will take you straight to check out.